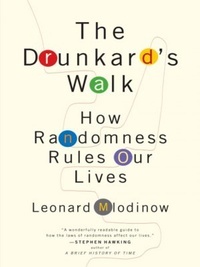 A drunkard's walk is a type of random statistical distribution with important applications in scientific studies ranging from biology to astronomy. Mlodinow, a visiting lecturer at Caltech and coauthor with Stephen Hawking of A Briefer History of Time, leads readers on a walk through the hills and valleys of randomness and how it directs our lives more than we realize. Mlodinow introduces important historical figures such as Bernoulli, Laplace and Pascal, emphasizing their ideas rather than their tumultuous private lives. Mlodinow defines such tricky concepts as regression to the mean and the law of large numbers, which should help readers as they navigate the daily deluge of election polls and new studies on how to live to 100. The author also carefully avoids veering off into the terra incognita of chaos theory aside from a brief mention of the famous butterfly effect, although he might have spent a little more time on the equally famous n-body problem that led to chaos theory. Books on randomness and statistics line library shelves, but Mlodinow will help readers sort out Mark Twain's damn lies from meaningful statistics and the choices we face every day.